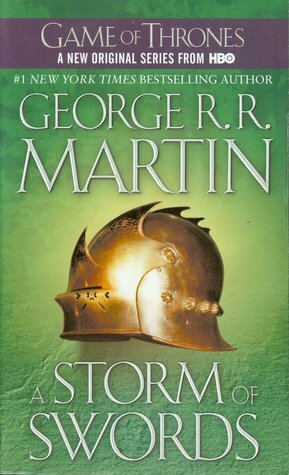 Here is the third volume in George R. R. Martin’s magnificent cycle of novels that includes A Game of Thrones and A Clash of Kings. Together, this series comprises a genuine masterpiece of modern fantasy, destined to stand as one of the great achievements of imaginative fiction. So after the events of Clash of Kings, where it became the beginning of the aptly named “clash of kings” and an all out war for the throne…many of our main characters are still trying to find some solid ground to stand on. Solid ground which honestly doesn’t exist, unless you’re Daenerys…in which case all you have to do is command things to go your way and they basically do. We learn that weddings are events full fantastic food (seriously, what’s up with all the food?! ), baudy bedding traditions, and things bad for ones health. In fact I’m trying to think if there was a wedding in this book that didn’t turn out to be awful for at least one person…and I think their are like 5(ish) weddings or something similar in this one. There is even more intrigue and outright deceit, some new friendships, new romances…and new magic! We are also treated to two new points of view, Jaime Lannister and Samwell Tarly..I actually appreciated getting to know Jaime despite the internal groaning when I saw the first chapter. I figured Jaime for a brilliant soldier, but a rather weak minded individual that just does what he’s told. But once I finished the book i can honestly say I like him, he’s got gross tastes in women (namely the only woman he has eyes for), but he’s actually rather smart and has a lot more to his story than I thought he had to offer. We get his account of what happened the day everyone named him Kingslayer and we get more on his relationship with Cersei, for better or for worse. We get to see more of Melisandre, who has gone from slightly scary to sort of weirdly pathetic. I mean she’s still terrifying in what she’s capable of, but I don’t have a mind for prophecy so anytime she conveniently changed her tone about something I just sort of snorted. Arya continues to be a badass, and if at all possible has become more so. Jon Snow is coming into his own at the Wall and beyond, and I’m super excited to find out just how his story progress because it has HUGE potential. Catelyn is still irritating as hell and still among my most hated characters. Joffery is at his most Joffery-est…which basically left me seething or wishing someone would strangle him with his own crown. Sansa’s chapters were also a pleasant surprise, as she slowly becomes more of a player in the game and less of a pawn. That being said, by the end of the book she’s still very much terrified of everything and everyone like she is at the beginning, she’s just a bit more aware of what’s going on and how to react. Tyrion is another favorite that remains where he is. These books would be a rather serious if not for his witty quips and insults, and over all cynical nature about the world and his family. And last but not least Dany…my lovely Kahleesi, the Mother of Dragons, the unburnt, the….why the hell does she have so many titles? Dany’s chapters are some of my favorite parts of these books. She’s in her teens and she’s already striking fear into the hearts of men (mostly men anyway) over the Narrow Sea. There were some new developments that I didn’t expect, and some that hint that her story might slow down for a bit in the future. At this point my list of people I want dead has gotten longer, even with a few crossed out. I feel like Arya when she whisper each name before she goes to sleep. The fact remains that even a book this huge can still be a ton of fun read. It might take me a while, and there might be a few chapters I could careless about but I still appreciated all of it. The warring points of view lend a full view of events as they happen, you also get to see ‘bad’ characters as good people and vice versa. I look forward to getting into A Feast of Crows! 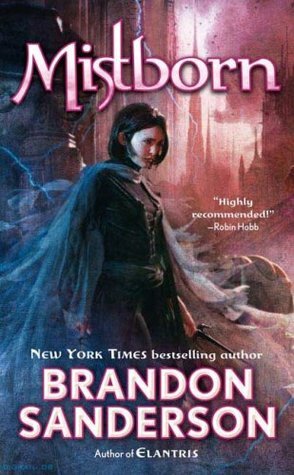 Image | This entry was posted in Book Reviews (2015) and tagged 4.5 Stars, fantasy, review. Bookmark the permalink. I think I managed to avoid spoilers with this, which is why it’s so long. And this would be part of season 3 and 4, but they start to diverge quite a bit with this one. Arya is my favorite GOT characters, followed very closely by Tyrion. They are both so smart, underdogs, and survivors. I found getting to know Jamie a good thing also. I like that the characters are well rounded in most cases. FYI the links to Book Review Blogs in the footer don’t work. I really, really, really need to begin this series..wow from the world to the characters this sounds divine.